Corrie Baldauf, Frames for the People: A City of Halos, 2013, digital video, 13 min. 48 sec. Possible Futures: What is to be done? The 2014 Windsor-Essex Triennial of Contemporary Art highlights and celebrates the distinct voices and compelling work by artists in southwestern Ontario, Eastern Michigan, Windsor-Essex and Detroit. The Triennial builds on the AGW's legacy of promoting the region as a cultural hub of (post-) industrial transformation and urban renewal. 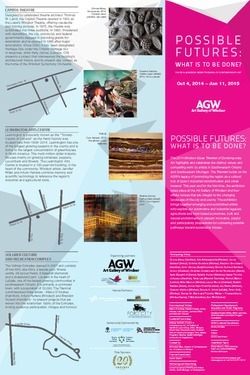 This year and for the first time, the exhibition will take place at the Art Gallery of Windsor and four offsite venues - The Leamington Arts Centre, Leamington; The Vollmer Culture and Recreation Complex, LaSalle; Drouillard Road, Ford City and the Capitol Theatre in Windsor - that have been an important part of the changing landscape in the area. The exhibition brings together emerging and established artists who explore our automotive and industrial legacies, agricultural and food-based economies, built and natural environments to present innovative, playful and participatory propositions for cultivating possible sustainable futures. Looking back in the region's history through the lens of contemporary art, artists working in mediums that range from photography, video, installation, sculpture, drawing and painting draft up possible pathways and environs for the next generations. Curated by Srimoyee Mitra with the curatorial committee: Melissa Bennett, Curator of Contemporary Art, Art Gallery of Hamilton; Lucy Howe, artist, Windsor; Stuart Reid, Director/Curator, Rodman Hall Art Centre, Brock University, St. Catharines; Gregory Tom, Gallery Programs Director, Eastern Michigan University Art Department, Ypsilanti. Possible Futures: What is to be done? The 2014 Windsor-Essex Triennial of Contemporary Art is organized by the Art Gallery of Windsor in collaboration with Tourism Windsor Essex and Pelee Island (TWEPI) and Windsor Endowment for the Arts (WEA) and is generously funded by the Ontario Trillium Foundation. Title Sponsor: Caesars Windsor. The AGW would like to acknowledge funding support from the Ontario Arts Council, an agency of the Government of Ontario and the Canada Council for the Arts. Media Launch for Possible Futures: What is to be done? Screening of Kelly Jazvac's video "Recent Landscapes"